Richmond, VA – Can you imagine telling your dog, “Let's go to the vet!” and seeing her tail wag? How about getting out your cat’s carrier and seeing him come running? Local pet owners won't need to imagine it if they visit our doctors at Betty Baugh’s Animal Clinic. That’s because they are a part of a new initiative sweeping veterinary medicine designed to ease the stress, fear, and anxiety so many pets experience while at the veterinarian. Known as Fear Free™, the training and certification program helps veterinarians modify their procedures, handling, and facilities to help pets feel safe and comfortable while receiving the medical care they need. 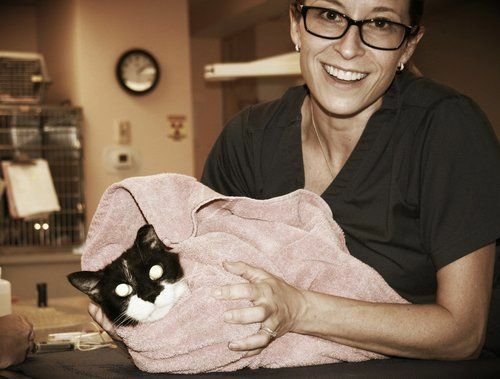 “As animal lovers and veterinary professionals, our doctors and staff were motivated to reduce the fear that we see some of our patients’ experience. We understand that mental and physical health are closely related, and by practicing Fear Free™ methods our impact on your pet’s overall health is greater,” said Dr. Hannah Mercurio, a veterinarian at Betty Baugh’s Animal Clinic with a special interest in behavior. “Some of the tools we use improve your pet’s veterinary visit are calming pheromones, special treats, scent-free cleaning products, and mats to improve grip. Our staff is sensitive to pets who get stressed in the waiting area and will help troubleshoot to find the best place to wait and reduce wait time. We focus on keeping a quiet and calm ambiance and our staff is trained in handling centered around gentle touch,” stated Dr. Mercurio. Pet owners who would like their pets to experience the Fear Free™ difference can schedule an appointment by calling us at 804-288-7387.